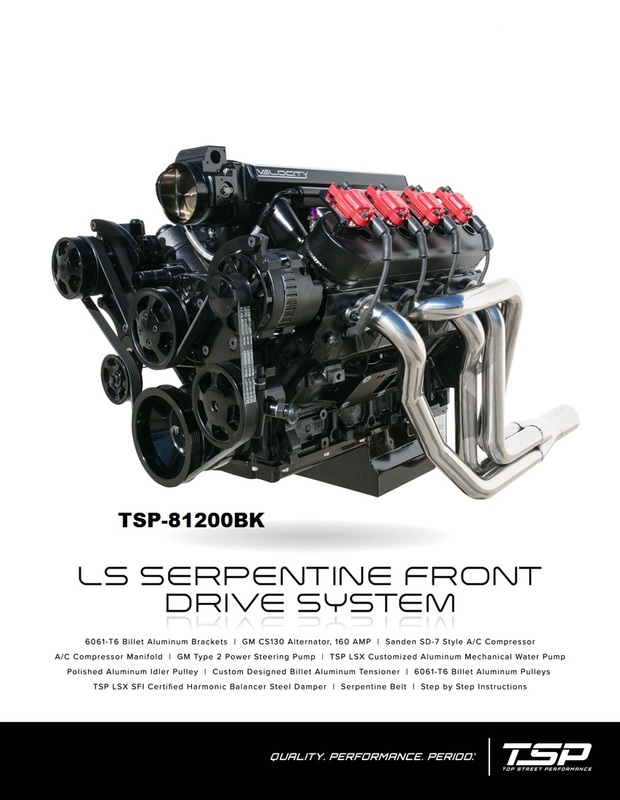 TSP'S LS Serpentine Front Drive System is finally here. Designed for performance and style, it's sure to turn heads. If you're looking for a way to dress up your LS swap, look no further. And the best part: this kit comes with everything you need, including an integral power steering reservoir. Fits LS1, LS2, LS3, & LS6 (NOTE: Installation on LS3 engines requires replacing water pump backing plate bolts with M6 x 1.00 x 15mm flathead screws (included). Due to the relocation of certain accessories, may not fit in stock applications (See dimensions). Will not fit engines with Variable Valve Timing.) NOTE: This System Ships For FREE In the Continental US!